website...nonexistent, and there's no info on the Maine Brewers' Guild site. I've had this one from the craft beer club in my fridge for ages now. I just couldn't bring myself to drink it. 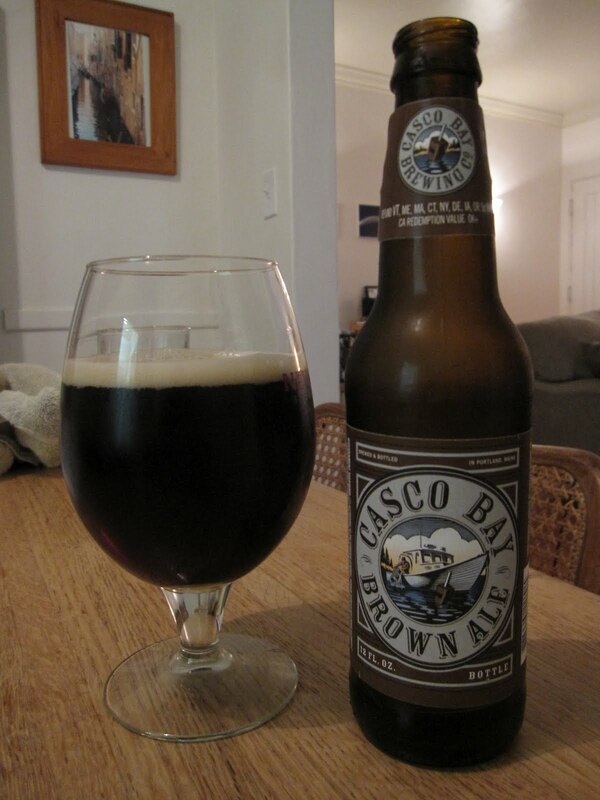 I'm in the mood for brown ale even less frequently than I'm in the mood for a stout. So I'm not too excited about this. It looks just like Coke in the glass, and it smells like a brown ale, basically like a watered-down run-of-the-mill porter- all roasty malt and basically nonexistent hop aromas. Man, I'm being all negative and I haven't even taken a sip yet. It has typical brown ale flavors, similar to what you'd expect from a porter, but there are some welcome surprises. First, while it's pretty flavor-rich, it's fairly dry so it's not overly weighty. And it's got a pleasant spiciness similar to rye beers, plus an interesting tartness, I presume from a respectable-for-a-brown-ale hop load (32 IBU). But in the end, it's still a brown ale, and it's just not what I'm after when I'm in a beery mood. It's unfortunate that the only two beers I've been able to have from Casco Bay are of styles that I don't really like. I feel like I've given them kind of a bad rap. They may well have something interesting going on up in Maine, and I can definitely see how someone could appreciate both this and the Riptide. But I'm just not that someone.